Mmmm, pie! Len Rizzi (photographer) photo in the public domain. Well almost all. 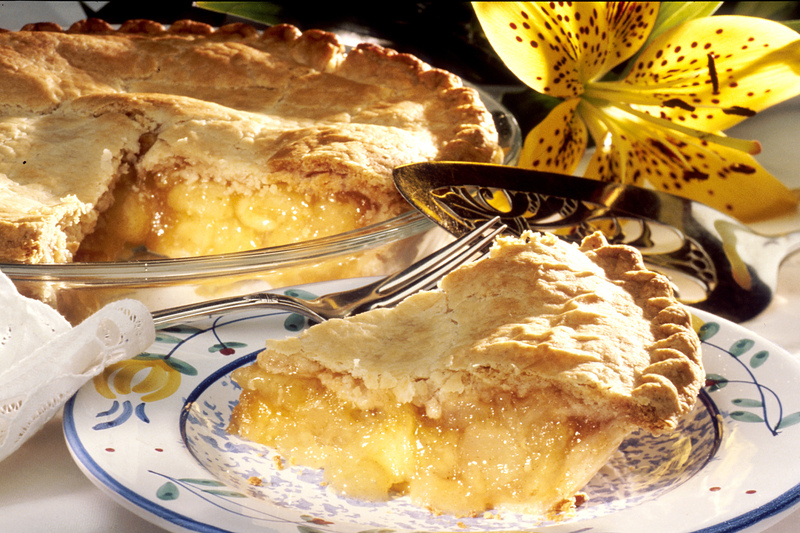 In pie, filling and crust are co-dependent. Co-dependency is not always neurotic. What would a pie be without the crust? It might be pudding or jam but it would definitely not be pie. What would a poem be without simile or metaphor or rhythm? It might be a story or a rhyme but it would not, as literature goes, be considered a poem. If a majority can transform an opinion into fact, then unanimity makes it indisputably factual, right? He also says this is the best crust, so his opinion added to mine turns our agreement into an indisputable fact. This is adapted from the recipe from Tenderflake Lard. They use 100% all-purpose flour and 100% lard–I use half lard/half butter; and slightly more than half all-purpose flour / slightly less than half white whole wheat, which make this pie crust nutritious, right? – In a 1 cup measure, combine the vinegar and egg. Add water to make the 1 cup measure full. Gradually stir liquid into the flour/lard. Add only enough liquid to make dough cling together. You will most likely have some liquid left over. You can use your pastry blender or knives to mix the liquid in well. If you’ve never baked a pie, don’t expect that you can learn to make perfect crust just by reading a recipe. Pastry-making is something that requires an apprenticeship, as writing does, because although it appears easy, there are all sorts of subtle tricks going on when an experienced baker makes a crust, and an uninitiated baker probably won’t intuit all of them without a little mentoring. You might, however, have a knack for baking and you could turn out a fairly decent crust–one that will please your family, by following these basic steps. If you’re new to pie-baking, your first efforts probably wouldn’t win a contest judged by professional pastry-chefs, in which you’d be competing against people who have attended the Culinary Institute of Arts and worked at Daniel’s in New York City for ten years. This does not mean that you shouldn’t bake the pie. You’ll have fun and your family and friends will appreciate it. You might even win a ribbon at the county fair. And with some practice, if it’s important to you to perfect a world-class prize-winning pie crust, you’ll learn how. Having the goal to make pie as good as pie can be, will give you the stamina to keep making dozens of pie crusts until you figure out exactly what you’re doing and what you’re specialty is. And from whom have you learned how to bake or write better? Ok – favorite pie would have to be a tie between coconut cream and old-fashioned southern pecan. Or maybe the first pumpkin pie of the season…or well it seems I have alot of favorite pies! I usually never have a favorite anything. Favorite color? Favorite book or movie? Favorite chair? I never can choose. But pie? Cherry. Not that I won’t eat just about any other kind–this weekend I made homemade butterscotch pudding, with real butter, real scotch, nothing artificial. It was so delicious I started fantasizing about butterscotch pie.